Eastern volleyball coach Megan Cross talks with her team during a timeout Wednesday night during a Division IV district semifinal against Portsmouth Clay at Jackson High School in Jackson, Ohio. JACKSON, Ohio — A tough way to go. 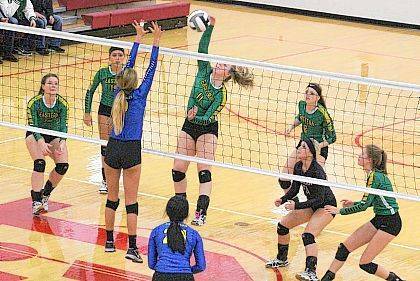 The Eastern volleyball team had its 2017 campaign come to an unfortunate end Wednesday night during a 21-25, 25-20, 25-19, 25-12 setback to second-seeded Portsmouth Clay in a Division IV district semifinal contest at Jackson High School in the Apple City. 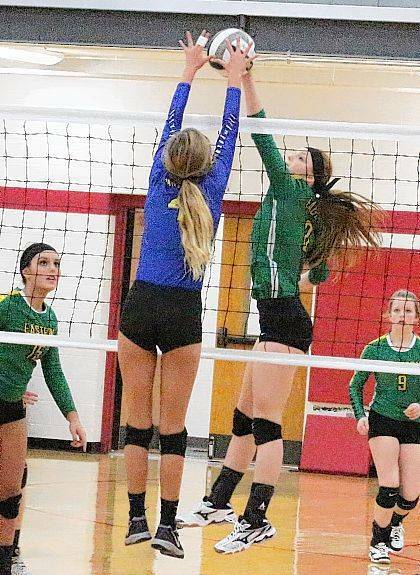 The third-seeded Lady Eagles (16-8) battled through 22 ties and 13 lead changes throughout the course of the match, but the Lady Panthers (21-3) overcame a Game 1 loss by piecing together a hard-fought win in the second set, then eventually cruised over the final two games to advance to Saturday’s district final. PCHS will face TVC Hocking champion Waterford in the Jackson district final at 2 p.m. The top-seeded Lady Cats defeated Pike Western by 25-20, 25-10, 25-12 margin in the first semifinal on Wednesday night at JHS. 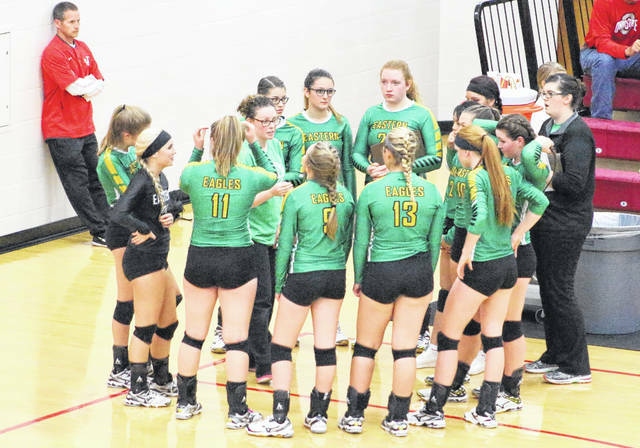 The Green and White came in looking for a little revenge after being knocked out of last year’s district tournament by these same Lady Panthers, and it appeared that both clubs were out to make a statement from the start of the match. Game 1 featured 11 ties and six lead changes alone, and neither squad led by as many as five points. Eastern overcame deficits of 15-10 and 16-11 early on and claimed a permanent lead at 20-19, then reeled off five of the final seven points. The four-point win was Eastern’s largest lead of the night and gave the guests a 1-0 match advantage. Game 2 was just as competitive as both squads battled through five ties and two lead changes, with the Lady Eagles claiming their largest leads at 2-0 and 4-2. Clay rallied with a 10-3 run to build a 12-7 edge, but EHS answered with nine of the next 13 points to knot the game up at 16-all. PCHS scored five of the next six points for a 22-17 lead, and Eastern was never closer than two points (22-20) the rest of the way as the hosts tied the match at one with the five-point outcome. With only one point separating the two teams through two games, it appeared to be anyone’s race. And after five ties and four lead changes in Game 3, both teams found themselves deadlocked again at 10-all. The Lady Panthers won the next four points and never trailed the rest of the match. The Lady Eagles closed back to within 14-12 and 17-14 in the third game, but the Blue and Gold answered with eight of the final 13 points to secure a 2-1 match advantage. Eastern fell behind 2-0 and tied things at two in Game 4, but the Lady Panthers built a double-digit lead at 20-10 and maintained it the rest of the way en route to the 3-1 match triumph. As the night progressed, the Lady Eagles’ attacking numbers continued to decline. The guests had 11 kills in the first set and eight kills in the second, then produced just seven and five kills in the final two games. The blocks also went from 13 in the first two sets to just three blocks the rest of the way. It wasn’t the ending that EHS coach Megan Cross had hoped for Wednesday night, but the first-year mentor was proud of her troops’ effort — both on this night and all season long. 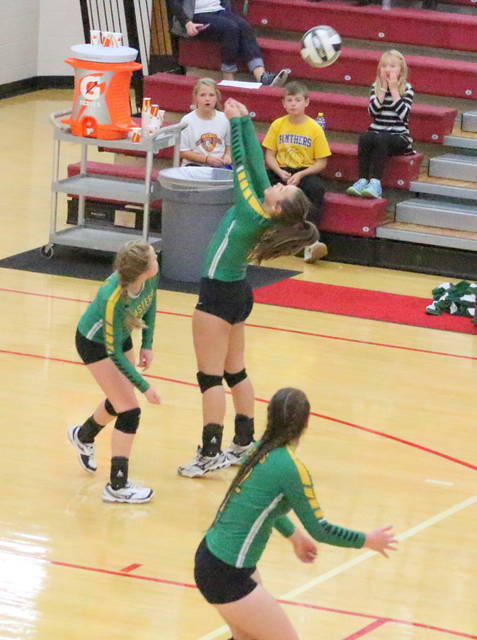 The setback also marked the final volleyball match for seniors Mackenzie Brooks, Morgain Little, Sidney Cook, Morgan Baer and Elayna Bissell in the Green and White. That quintet has appeared in three straight district postseasons, as well as all of the regular season accolades they have accomplished. Cross acknowledges that it will be tough to replace that kind of experience and leadership, but she does believe that the Lady Eagles can be right back in this position next year with more hard work. Little led the EHS service attack with eight points, followed by Jenna Chadwell with seven points. Baer and Alessandra Mortella were next with six points apiece, while Brooks chipped in five points and a team-high two aces. Ally Barber completed the serving attack with two points. Little and Mortella also had one ace apiece in the setback. Brooks led the net attack with 15 kills, followed by Barber with seven kills. Chadwell and Little each had three kills, while Baer, Bissell and Kelsey Casto had a kill apiece. Barber and Brooks also recorded six and five blocks, respectively. Baer dished out a team-best 27 assists and also had 15 digs. 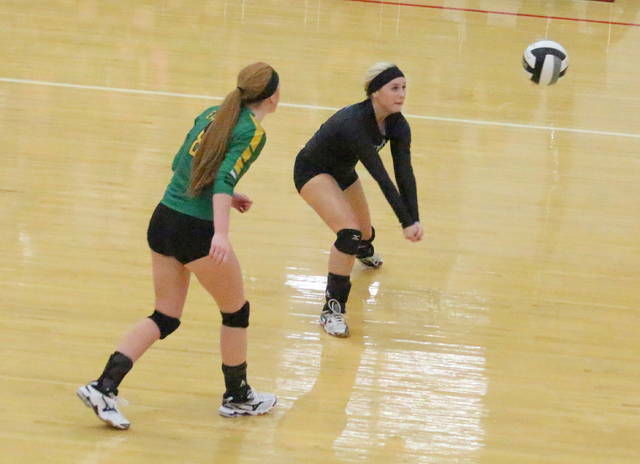 Bissell led Eastern with 16 digs defensively. Delanie Gilliland led PCHS with 15 service points, followed by Jensen Warnock and Taylor Lewis with nine points each. Lewis also had a team-high five aces. Lewis and Warnock had 22 kills apiece, with Lewis also producing three blocks for the victors. Eastern — which had an eight-match winning streak snapped — finished the season with a 12-4 record in Tri-Valley Conference Hocking Division play, which was good enough for third place overall.